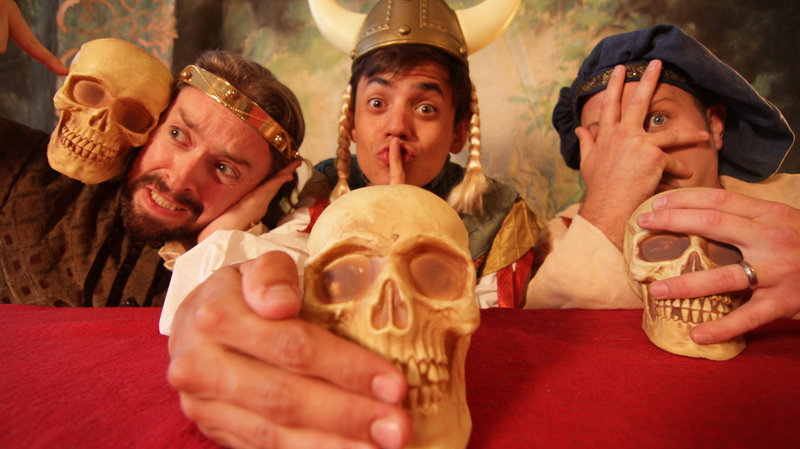 The Reduced Shakespeare Company’s production of “The Complete Works Of William Shakespeare (abridged)” gets a first-rate showing at St. Louis Shakespeare’s latest offering. Too many “Shakespeare’s” in that sentence? Well, you’ll want even more when the play ends at Grandel Square. In fact, you’re never sure just when it will end because they must do their final play, “Hamlet,” three more times before they can call it a night- speedy, speedier and in reverse. That’s the kind of nonsense you’ll see throughout this performance and it will have you rolling in the aisles. But be careful, because the actors are frequently in the aisles as well. There have been a few productions of this “Shakespeare Lite” laugher in our town before but, like “Godspell,” it’s easily updated and open for more topical humor so it always stays fresh. St. Louis Shakespeare skewers everything modern and local including themselves with a reference to their last production of “Coriolanus.” This is not your father’s Shakespeare and it’s definitely not your 15th Century Shakespeare, but it will probably give you a good insight into why everyone who loves theatre loves this man’s work. The actors work in sync and you have to gape in amazement at some of the accomplishments they pull off when reducing all 36 plays (and even the sonnets) into an hour and a half. Jamie Kurth starts things off with a serious note that soon turns silly and that sets the tone for the evening. Ben Ritchie plays the official Shakespeare scholar and he too succumbs to the dumb. Joshua Nash Payne rounds out the devilish trio and gets the dubious distinction of playing most of the women in the plays. “Romeo and Juliet” leads off the evening and the bizarre telling of this tragedy lasts 12 minutes- which means, as Ben Ritchie tells us, we’re likely to be here for another seven-plus hours. So they try to speed things along by making short work of “Titus Andronicus” as a cooking show complete with Julia Child. And if you’ve ever seen this play as Shakespeare wrote it, you’ll know how appropriate this approach is. Then the entire slate of comedies gets boiled down to a quick pastiche that has our troupe racing through a composite smashing all of the comedies into one, short soap opera. Josh, who has never been a fan of “Hamlet,” decides to skip out at intermission and Ben follows to persuade him to return. As Act II opens, Jamie is left to entertain the returning audience by passing around a 3×5 card encapsulating all of the sonnets to be passed among all of us while he talks on his cell phone to see if our other two intrepid actors will return in time to bring us “Hamlet.” They do and more audience participation ensues as we deal with the id, ego and super ego of Ophelia. Then we wind it all up with the aforementioned triple re-play of “Hamlet” as we reluctantly leave this tireless trio. Suki Peters has directed this nonsense with a flair for fun and a keen eye for the Bard. It’s non-stop action and, due to the always suspect acoustics in the Grandel and the constant state of laughter, we unfortunately miss a few of the “throw away” lines that keep coming rapid-fire. The cluttered set of Amanda Handle is perfect and the costumes of JC Krajicek are delightful- right down to the various colored tennis shoes. Several dressers help out backstage and onstage at various points including Morgan Elaine Hatfield, Sara Rae Womack, Meg Brinkley and Maggie Murphy. They are an integral part of making this madhouse a success. If you’re not a big fan of Shakespeare, this may change your mind. And if you know his plays well, this will keep you doubled over with laughter. 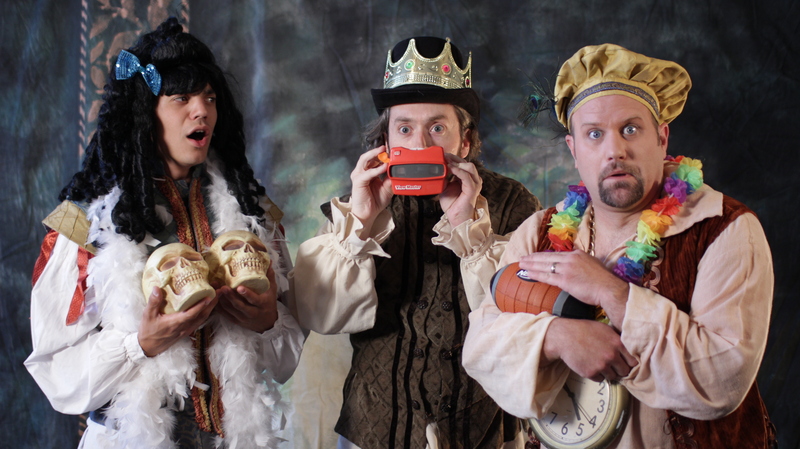 “The Complete Works of William Shakespeare (abridged)” is an evening in the theatre you won’t soon forget. Join the crowd as St. Louis Shakespeare Company brings us a more bizarre side of the Bard through August 19th. This entry was posted on August 12, 2012 at 9:43 pm08 and is filed under Uncategorized. You can follow any responses to this entry through the RSS 2.0 feed. You can leave a response, or trackback from your own site.